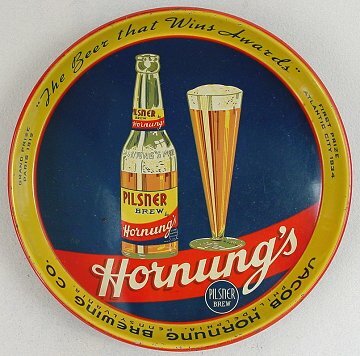 ""The Beer That Wins Awards""
"Grand Prize Paris 1912 - First Prize Atlanctic City 1934"
Philadelphia, Pennsylvania Comments:I did not even know this tray existed for the longest time. I had the version with the two bottlesClick Here to take a look., but I had never seen this one until it poped up on one of Don's Auctions. I have seen a couple since, so I guess they are out there. Both of these are very sharp trays when they are clean.